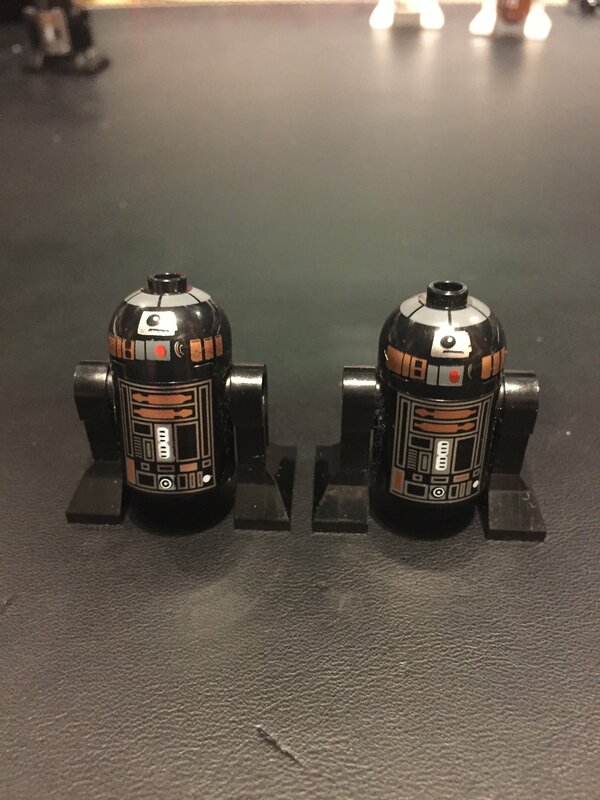 I just purchased a few minifigs 2nd hand and amongst them are two of what I believe to be R2-Q5's. Both appear to be identical (except for wear) with the exception of one having a solid stud on top and the other being vented. Can anyone confirm these differences and if so advise if each was from a different set or not. Given that this R2 droid was in three sets spanning 2006 through 2015 when the Death Star finally retired, it's no big surprise that there is a running change in one of his pieces. Bricklink does not recognize it as a variant, nor would I think any collector would care. Thanks for the super quick response. I was just intrigued by the difference. 30367cpr0003 for #10188 and the advent calendar for 2008 to 2011 (which is odd considering the Death Star didn't retire till 2015). Thanks for digging in a bit further but the R2-Q5 and the R2-D5 differ greatly in the appearance of the domed parts that you list. Essentially. to all intents and purposes the body of the droid is the same but 30367bpr0003 is for the R2-D5 and 30367cpr0003 for the R2-Q5. So... this means that there doesn't appear to be any part number difference between the vented and solid stud variants of the R2-Q5 figure. Interesting! So... this means that there doesn't appear to be any part number difference between the vented and solid stud variants of the R2-Q5 figure. 30367bpr003 could better be written as 30367b-pr003; and 30367c-pr003. They're not and there is no hyphen, but bear with me. 30367b is an unprinted dome with a blocked (what you've called "vented") stud. 30367c is an unprinted dome with a hollow (what you've called "solid", but which is something else) stud. The "pr003" on the end just means they are printed with a particular design. What BrickLink reports as being in a particular set is simply somebody's personal opinion - and not even necessarily fact. Furthermore, without delving into dates when changes were made, it's quite possible there are variants of each set with each stud type. TLG, on the other hand, use two different element IDs - 4293189 and 6023418. The difference does do not necessarily relate to the stud style. The latter only appears in some Death Stars. The fact that they have the same design ID, 55439, means that TLG consider them to be identical and interchangeable. Notwithstanding that what you've said is incorrect, I think you're trying to read too much into BrickLink's part numbers. As I have seen on countless occasions; Bricklink isn't the be all end all of parts/inventory. For instance: Bricklink lists The Forestwoman's head (part no. 3626bp40) open blocked stud from set #6071 . I have 3 Forestman's Crossing sets and each head is a solid stud part no. 3626apx2. Thanks for the explanation on the breakdown of the part number, however this seems to increase the confusion in my case. The TLG element ID's are useful in that they identify the different print designs though I don't agree they are interchangable as the design is completely different with 4293189 being the design of the R2-D5 from #6211 and 6023418 being for the R2-Q5 from the Death star #10188. However, what I am saying is I have two variants of 6023418, one with the hollow stud and one with the blocked stud so using both a 30367b and 30367c as the base element before print. That's entirely normal when you start doing this sort of thing! The point is that you don't know any of that, simply because you don't actually know what any of element IDs are. You're using logic to guess, and that gets you nowhere because TLG aren't consistent. It just isn't logical. Absolutely identical parts can have different element IDs and noticeably different ones can have the same ID. Earlier parts can be in later sets and later parts in earlier ones. There are also likely to be more variants of a part than BrickLink's numbering suggests. Sometimes you can get a better idea of what's happening because the part carries the design ID moulded into it. Printed parts don't - if they've got a number it's the number of the unprinted part, not the printed one. With things like this, you can think you spot some sort of pattern but, given enough sets, you'll eventually not only prove that pattern is wrong, but that there actually can't be a pattern! You have two 55439s. That's all you know. If you want to use BrickLink's numbering, then you're on a hiding to nothing if you try align it with TLG's design IDs or element to IDs. If you had enough other examples of known provenance, you might, and only might, be able to guess from which sets those original two came. If you want to know why there are differences, the answer is simply because there are often differences like that in similar or nominally identical pieces. FWIW, "R2-D5" in #6211 is widely reported as being a typo, and that it should have been "R2-Q5", like the other sets. A Star Wars expert may be able to throw some light the matter. No Star Wars expert, but "R2-D5" was mostly used as a labor droid and was white and red in color. "R2-Q5" is the correct name of the droid on the death star. A further thought on this struck me. If the printing appears to be different, then perhaps one or the other or even both are clone versions - if anything, they appear more "off" than actually different. After all, this is one of the bricks that doesn't carry a "LEGO" logo. 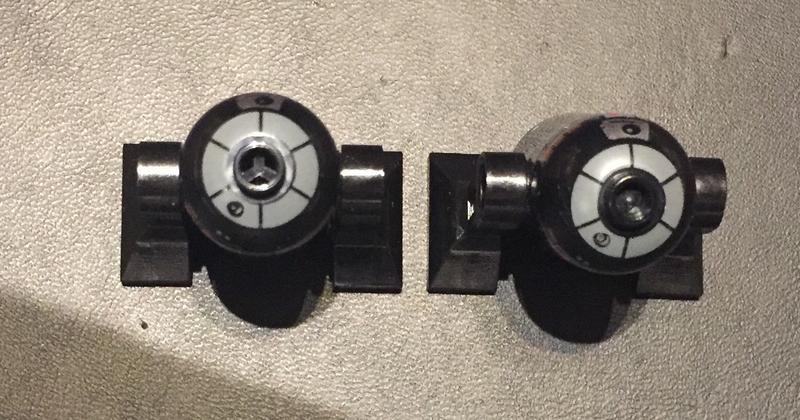 ^Actually, the new versions of the minifigure heads have "LEGO" stamped inside the "recessed stud" ; I would imagine it is the same for the dome part for the newer "recessed stud" R2-Q5. I also imagine than this part for even the last of the Death Stars would would predate such a change - if it has actually happened so far with the domes. There are an awful lot of heads in the world, so the moulds get updated more frequently. Well I certainly don't claim to be a star wars expert but the printing of the 'reported' R2-D5 from the Imperial Star Destroyer is defiantly different from the two R2-Q5's that I have. With regards them being clones, this is not the case. Maybe you can't make it out in the picture but the hollow stud of one of the R2-Q5's does have the Lego logo stamped inside and lifting the head of both minifigs reveals the Lego logo stamped into the main body. Checkout the picture below which shows the R2-D5 on the left and the two R2-Q5's to the right. You can see the difference clearly. As reference I am using the Unofficial LEGO Minifigure Catalog. Even that's not completely true. The ISD originally came with what BrickLink describe as 553px5. It may be that which accounts for your difference in print. However later versions didn't and came with the part being discussed earlier. Not only do parts change but so do sets. And TLG still regard them as being the same, even if they weren't. As the piece didn't have the design ID on it, 553 was a number, effectively random, that was used by various web sites instead. But your original question wasn't about that piece but about the later part and its stud type. The stud type won't tell you much. It rather depends on what question is being asked. In some cases, it doesn't matter what the question is. Or the answer, for that matter.